“San Andreas,” which opens on May 29, 2015 and is rated “PG-13,” also stars Kylie Minogue, Alexandra Daddario, Carla Gugino, Colton Haynes, Ioan Gruffudd, Archie Panjabi, Vanessa Ross, Will Yun Lee and Matt Gerald from director Brad Peyton and writers Carlton Cuse and Andre Fabrizio. To win your free “San Andreas” passes courtesy of HollywoodChicago.com, just get interactive with our social media widget below. That’s it! This screening is on Tuesday, May 26, 2015 at 7 p.m. in downtown Chicago. The more social actions you complete, the more points you score and the higher yours odds of winning! Completing these social actions only increases your odds of winning; this doesn’t intensify your competition! Deadline: Entries can continue being submitted through Monday, May 25, 2015 at 5 p.m. CST. These Hookup winners will be awarded via e-mail that night. 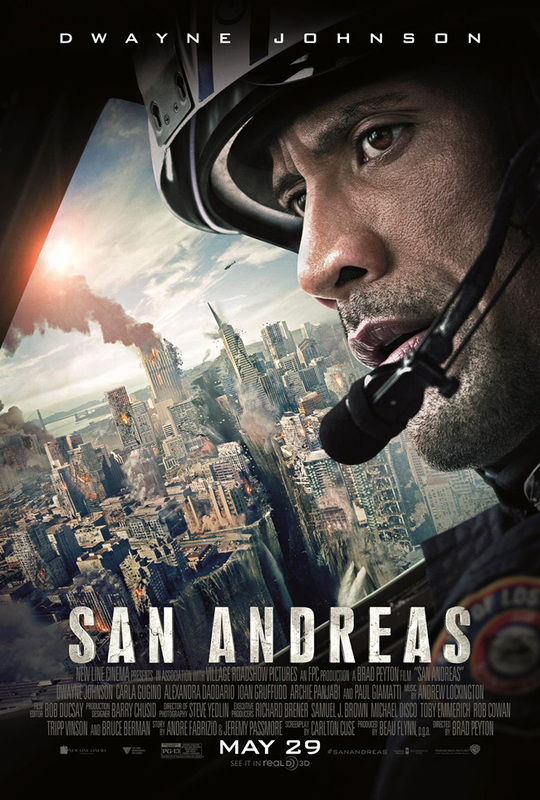 After the infamous San Andreas Fault finally gives – triggering a magnitude 9 earthquake in California – a search-and-rescue helicopter pilot (Dwayne Johnson) and his estranged wife make their way together from Los Angeles to San Francisco to save their only daughter. But their treacherous journey north is only the beginning. When they think the worst may be over, it’s just getting started. The movie poster for “San Andreas” starring Dwayne Johnson and Paul Giamatti. This HollywoodChicago.com Hookup is simple! Just get interactive in our social media widget above. We will award 60 admit-two movie tickets based on social entry numbers and/or randomly via e-mail for our “San Andreas” Hookup. Good luck!